This week, I’ve been eyeing many of the rugs currently on Rugs USA until the point where I wanted to show you some of the rugs I would pick since I can’t buy any at this time. They are currently having a 75% off Easter sale that ends…. TODAY!! So go ahead over there and find you a great deal and a rug you love before it’s too late! 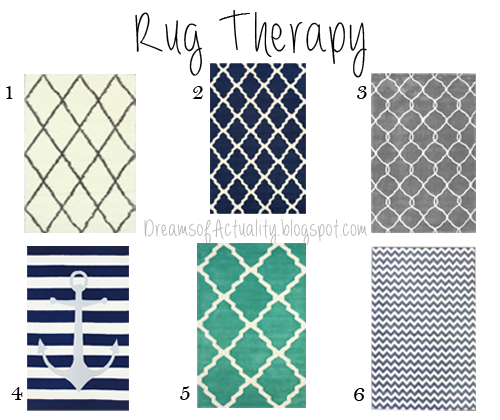 I also have seen that a lot of the rugs look better when you see it on the floor than just in a picture which helped draw my eye to many of the other rugs that were on the site but I narrowed it down to these 6. I’ve always liked this kind of rugs and seen many of them done DIY style like here. I see from the multiple of rugs chosen that blue seems to stand out to me. There were plenty of other rugs that I loved but it just so happens that the color I loved it in was blue. So I’m thinking whenever I move out I will have accents of blue throughout my master bedroom or another room in the house. I tend to not like many grey (or gray, whichever you prefer, luckily they named this slate) but this one is a beauty. Maybe it’s the interlocking going on between the shapes? Now here’s the love of my life! When I seen this, I automatically pictured it in Caiden’s room oneday. I have fallen in love with anchors which is weird because I’m not a sea, boat, or anything else relating to anchors person. I can see my overall taste is changing when it comes to design. I’m a lot more open to items that I used to be afraid to try because it seemed to bold or not in my comfort zone. You won’t believe what color I saw this in first when I decided that I liked it!! No it wasn’t blue, good answer though. Surprisingly it was grey. I love how bold this color is but yet relaxing and it being not too green is a score for me! Chevron, the style that everyone likes and I can see why. This rug just makes me want to spread out on it and go to sleep. The calming blues just make everything feel like you are on cloud nine. Are any of these rugs on your list? What would you call a deal on a rug?